Alfie’s Striders is a free for anyone community running club based in Ramsgate Kent. Anyone of any ability is welcome to join and enjoy! We are a warm and friendly group of people who enjoy the added peace of mind when running the safety in numbers , especially in the winter months. We have a long standing runners moto “We start together, we finish together”. 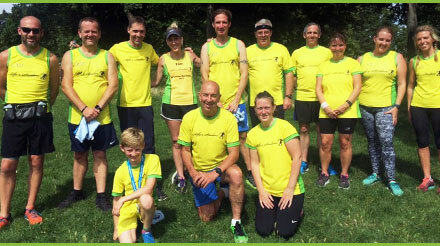 With a children’s charity at the heart of this run club we are proud of our strong values and are a non-competitive group of likeminded people who enjoy running together. We are open to anyone joining and have been welcoming people for the last 2 Years. We have no memberships , affiliations or fees so we also welcome runners from other clubs who join for an easy going run. Some of our runners also move on to other clubs for their own individual needs and goals. We like to keep this community club in line with our core values with no complications , internal competitions or club hierarchy’s, we just enjoy the friendly running. It is simple! – the group meets twice a week at the King George VI Park (Ramsgate Entrance reached from Victoria Parade Ramsgate) . You can see our published run times via our Alfie Striders Facebook Page or just turn up at the Park Entrance 10AM on any Sunday or at 7PM on a Wednesday. The group have additional run times which are published on the facebook page but if you do not have facebook access come along and let the group know and they will organise how to keep you updated.